A Sergio Aguero hat-trick helped Manchester City to a resounding 6-0 win over Chelsea in the Premier League yesterday. 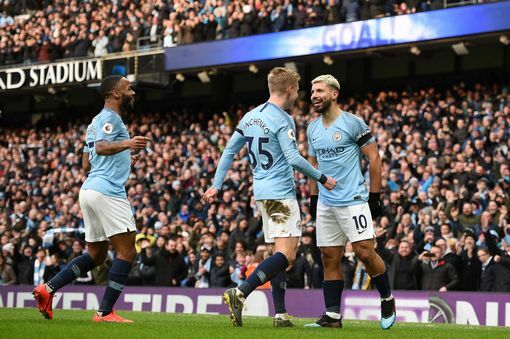 The result ensured City returned to the top of the Premier League, and extended their goal difference advantage over Liverpool - who have still to play a game in hand. Aguero recovered from an early miss from two yards to notch a record-equalling 11th Premier League hat-trick, and his goals saw him become City's all time top scorer in the top flight. After the game, Pep Guardiola said: "If you analyse the performance today, after tough games against Arsenal and Everton, playing the way we play with the intensity and the desire to find the spaces to attack in the right moment, the players were outstanding. I just have to say thank you to them for what they have done." Follow us for all the latest City news and transfer rumours. City are favourites to win all four competitions they are competing in this season. 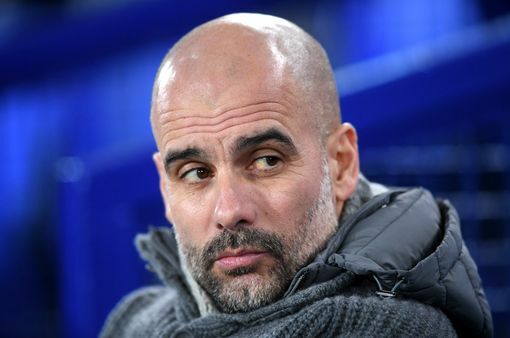 Pep Guardiola’s men are top of the Premier League, in the final of the Carabao Cup, and are in the last-16 of both the Champions League and FA Cup. Liverpool legend John Barnes insists Liverpool aren’t worried about City’s form that has seen them overtake the Blues in the Premier League. “Had we beaten City to go 10 points clear I would have said we would have won the league. “As much as we’re doing really well and the fans and some of my friends are getting excited, I said ‘well listen, when you come to February, March, and you look at the size of the squads, City have got a bigger squad if people lose form, people get injured’. “But we are still there, we can still go three points ahead of them if we win our game in hand. So Sergio Aguero drew level with Mo Salah on 17 Premier League goals yesterday - but the City striker has reached that amount in 532 less minutes. Raheem Sterling has been tipped to become one of the best players in the Premier League, from a winger who wasn’t too bad himself. City finally got their revenge for the 6-0 loss to Chelsea in 2007 yesterday. 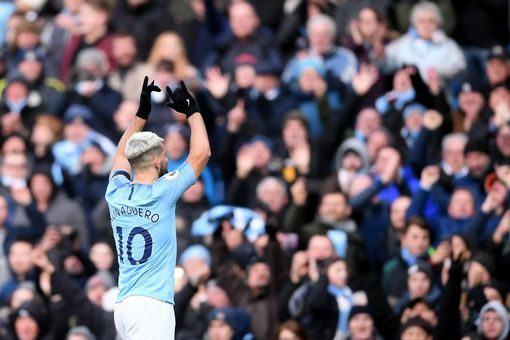 Sergio Aguero’s eight goals in 2019 is more than Brighton, Cardiff, Chelsea, Everton, Huddersfield, Newcastle, Southampton, Watford and West Ham have all managed as a team. City have a rare midweek off this week, so it would make sense for the players to get away for a day or two after a gruelling schedule. While some players might head for warm weather, Oleksandr Zinchenko has done the opposite. He’s just posted a video to his Instagram jumping into a freezing river. Whatever suits you, Oleks! 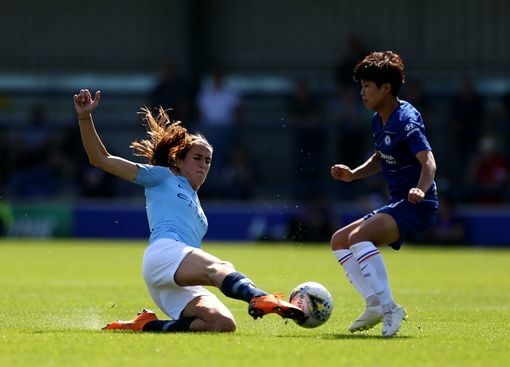 Jill Scott says City Women are disappointed, but won’t give up after blowing a 2-goal lead against Chelsea on Sunday. The result keeps City top of WSL1, but their two point lead over Arsenal can be caught with the Gunners’ two games in hand. “Anything can happen. Of course, we’re disappointed we couldn’t hold on for three points but there are still plenty of games to go. 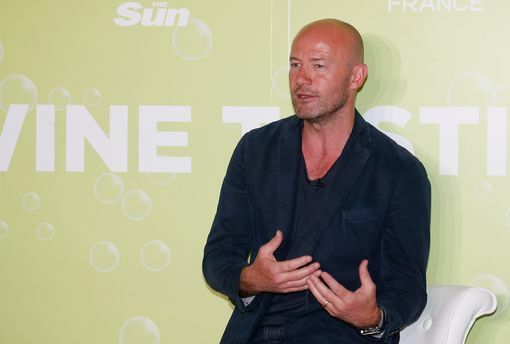 Alan Shearer says City and Liverpool should rule Tottenham out of the title race at their peril. Mauricio Pochettino’s side have done something similar in each f their past four league games, but it is actually very impressive that they keep getting results when none of those performances have been particularly great. Benjamin Mendy is ready to work his magic on PSG forward Kylian Mbappe, who is in Manchester to face United tomorrow night. 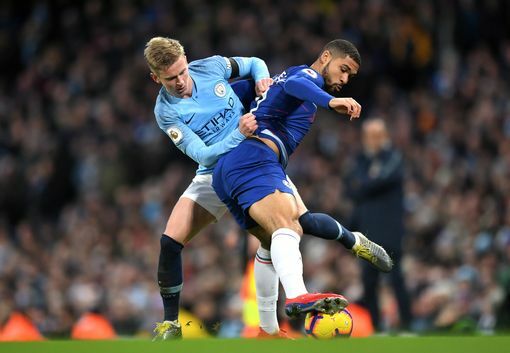 Aleks Zinchenko had no sympathy for Chelsea’s players after Manchester City dished out a 6-0 hammering. 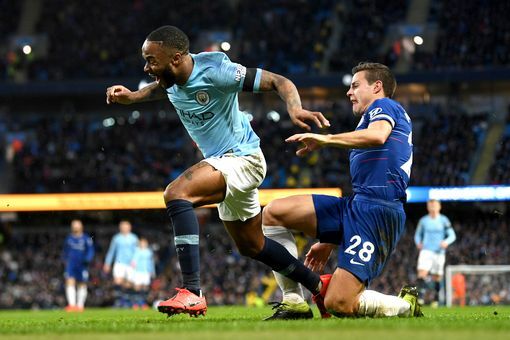 The utility player was surprisingly brought back in for his first league start since late December but had little defensive work to do as the home side dominated at the Etihad, his biggest contribution an assist for Raheem Sterling’s sixth goal. Chelsea defender Antonio Rudiger went over to the away fans at the final whistle to apologise for the performance while Cesar Azpilicueta described it as one of the worst nights of his career as Maurizio Sarri’s team suffered a humbling defeat. But Zinchenko was blunt when asked if he sympathised with the beaten players. “No, this can happen. It’s football,” he said. 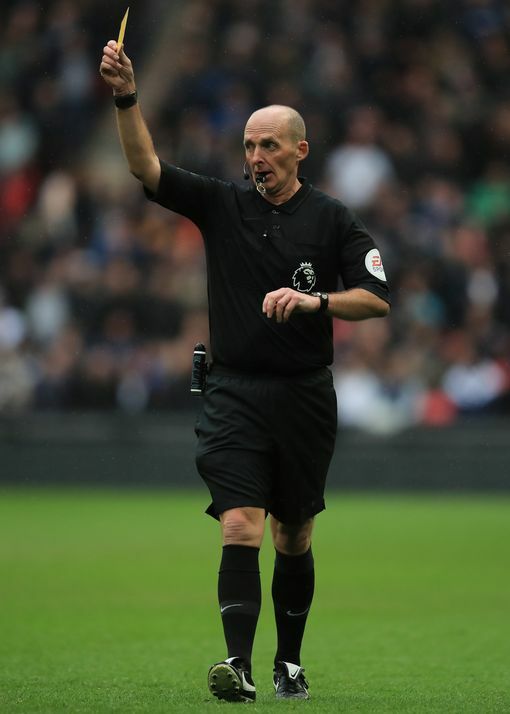 Referee Mike Dean has come in for criticism from some for his actions in yesterday’s win - particularly when he hid Sergio Aguero’s matchball at full time. But Dermot Gallagher says there’s no problem. That’s how he is. If you meet him, he’s a really nice guy, he’s very flamboyant and that’s his nature, he’s done it all his life so people know that. It’s going back to his ballroom dancing days when he had all the moves and he’s clearly still got them. With the match ball at the end, you can see with Aguero that the way he reacted was so funny. It was just a great bit of fun between a player and a referee and it shows that there isn’t this massive void between us. Liverpool legend ad former City striker Robbie Fowler says the current City side are the best in English football. 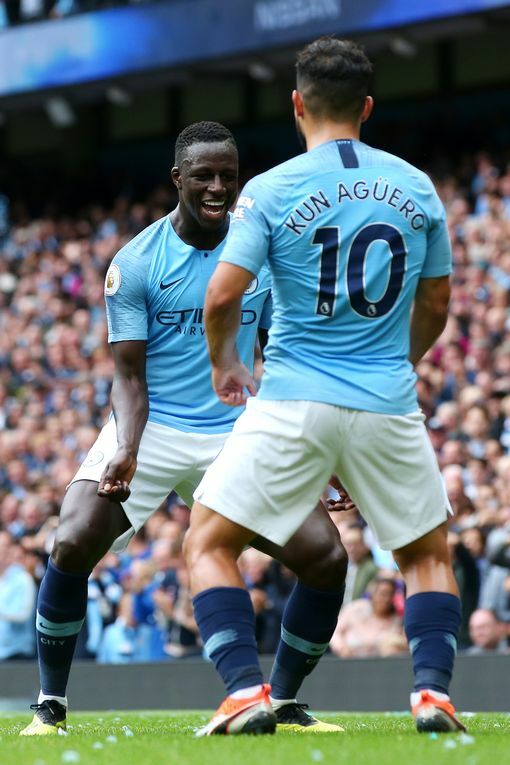 Benjamin Mendy has given teammate Sergio Aguero a nickname befitting of his goalscoring achievements in Manchester City’s 6-0 win over Chelsea in the Premier League. Aguero scored a hat-trick as City moved back to the top of the table on Sunday, and the striker also moved level with Mo Salah at the top of the goal-scoring charts on 17 goals. 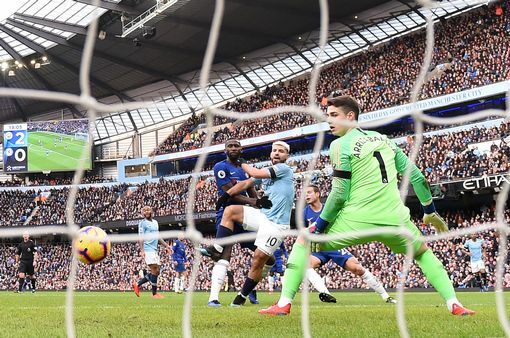 It was Aguero’s second hat-trick in a week after he achieved the same feat against Arsenal seven days before, and Mendy marked his teammate’s latest goals with a new nickname. Mendy was sitting in the stands as he continues to recover from knee surgery, and was documenting each goal against Chelsea with his reaction and City’s celebrations on Instagram. And when Aguero tucked away a second-half penalty to seal his hat-trick and score City’s fifth of the afternoon, Mendy revealed what he calls the striker. 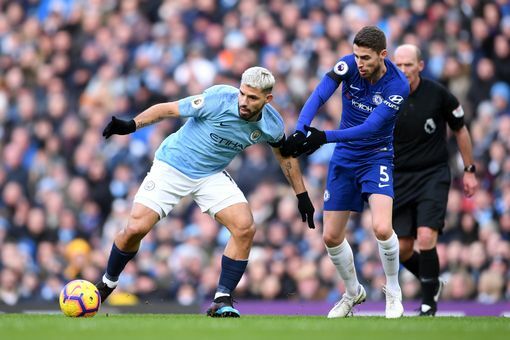 Alan Shearer says City targeted Jorginho as a way of stopping Chelsea yesterday, and used his Match of the Day analysis to highlight how effective the tactic was. “They were absolutely sensational, for the whole of that game they dominated Chelsea. Not only did they play their own game but what was also impressive was they stopped Chelsea from playing theirs. “We saw that if you stop Jorginho in the middle of the park you’ve got a very very good chance of stopping Chelsea. And I thought they did it brilliantly today. “The goalkeeper’s got the ball, there’s Jorginho. They’re just saying to him ‘go on, you pass it to him if you want. We’ve got the trap ready and if you do, then we’ll capitalise. So they don’t pass it to him, it goes out wide, and they win the ball back. “Exactly the same thing again - how many times do you see the goalkeeper look up and give the ball to Jorginho. They can’t pass it into him because he wants to start Chelsea moves and dictate play and he wasn’t able to do that today. 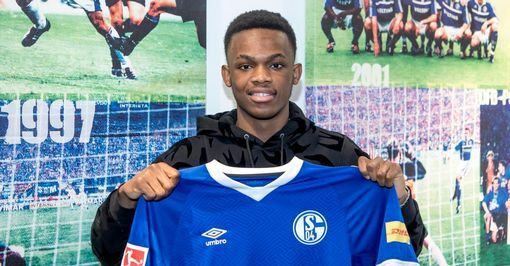 Rabbi Matondo left City in the January transfer window for Schalke for around £10m, and Football Insider claim there is a £60m buy-back clause inserted into his contract. The Wales international never made a first team appearance for City, but was highly rated by the club. City’s 11 goals this week takes their total for 2019 to 42 goals in 11 games since the start of 2019. 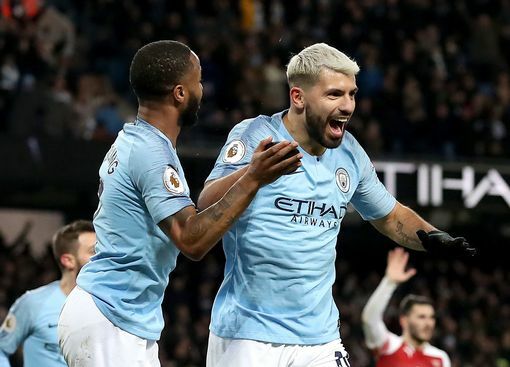 Sergio Aguero’s hat-tricks against Arsenal and Chelsea this week mean he has now scored a ridiculous 43 goals in 64 matches against fellow ‘big-six’ sides. Burton were on the receiving end of a 10-0 aggregate scoreline against City in the Carabao Cup recently, but they have seen the funny side after yesterday’s 6-0 win over Chelsea in the Premier League for the Blues. Defender Reece Hutchinson and the club’s official Twitter account teamed up for this brilliant exchange. Fair play. Ian Wright says Sergio Aguero still doesn’t get the praise he deserves despite his incredible scoring record for Manchester City. “It’s not like he is a Hazard, a De Bruyne, a Cantona or a Bergkamp, where they play in this area of the field where they are doing unbelievable things. “He is just in the box, scoring goals and finishing things off. 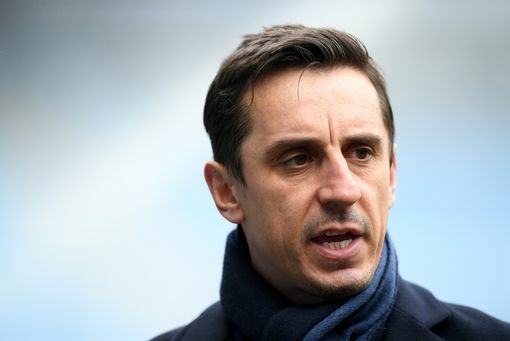 Gary Neville says the title race has really started this week as City have put ‘psychological pressure’ on Liverpool with three wins in seven days. “A few weeks ago they were seven points clear and when Manchester City lost at Newcastle you thought it was there - what an opportunity for Liverpool that was. “Winning the title is obviously about performance, but the mental side is huge. Our first title at Manchester United I never looked forward to it, I struggled with it, and so did other young players. City’s 6-0 performance had Chelsea lost for words, according to defender Cesar Azpilicueta. “It’s difficult to find the words to describe my feeling after the game. It is one of the worst nights in my career. It’s very frustrating, it’s very disappointing. The Chelsea boss headed straight down the tunnel without shaking Guardiola’s hand yesterday and he explained why. 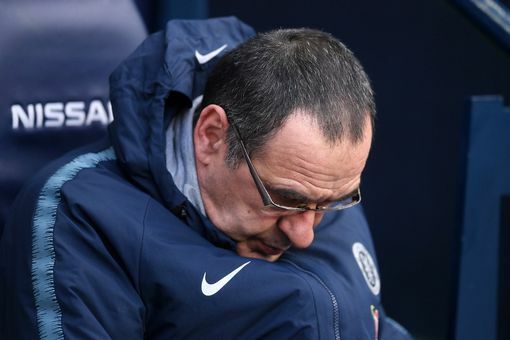 “I didn’t see at that moment,” Sarri said. “But of course as usually I will go to say hello to him later, as usual. 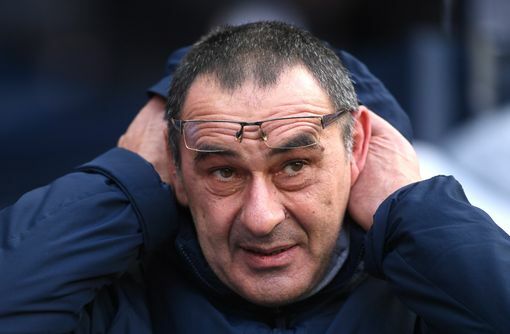 It wouldn’t surprise me if tomorrow, and I hope it doesn’t happen and I hope Sarri keeps his job, because the idea of losing his job after six months is ridiculous in the fact he’s done what he’s done. You just know when things start to turn a bit at Chelsea, it doesn’t normally end well and it usually ends quickly. And after the trolling City then apologised to Chelsea following the playing of their song. 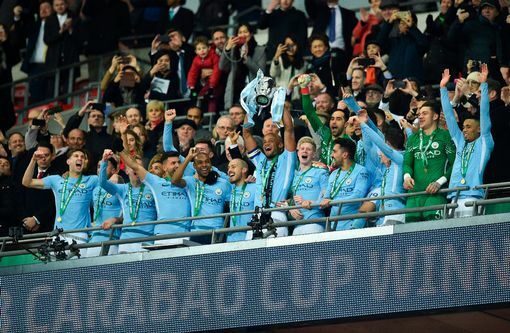 A City official had to contact the staff member in charge of the post-match music and they cut the song after about 30 seconds and reverted to Blue Moon, City’s usual post-match song. The official apologised to Chelsea, The Times reports. 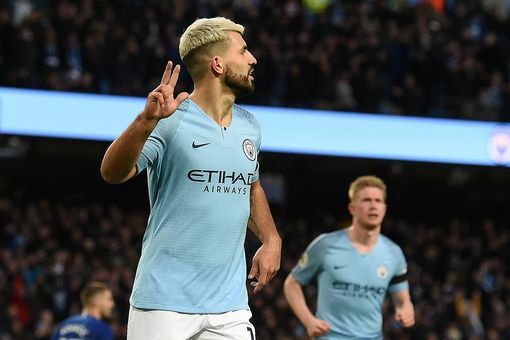 Man City striker Sergio Aguero equalled Alan Shearer’s record for Premier League hat-tricks in the 6-0 win over Chelsea on Sunday and the former England man believes City’s frontman is now the greatest foreign player to ever play in the Premier League.